A series of recollected hallucinations from my early weeks of hospitalization, 2016. As Bruce Springsteen begins his highly anticipated run on Broadway, I thought it was high time to recount when my infection-ravaged mind took me from the hospital to E Street. 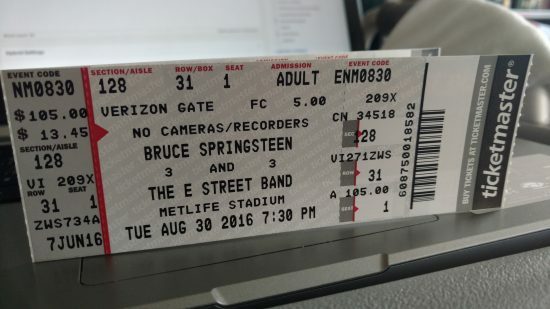 I certainly had Bruce on the brain: I entered Hoboken University Medical Center on August 26, 2016, and I had purchased two tickets to see Springsteen on August 30. My head must’ve known I was missing out. I’d somehow snagged VIP tickets to a show at a large shore venue where I’d never been before. I was in a special room with Bruce’s relatives, and we were supposed to receive little earpieces that would allow us to hear the show. I was getting frustrated, as the concert had already begun, and I didn’t yet have an earpiece. And then when I did get one, it didn’t work very well. I voiced my frustration: Why can’t we go through that door and actually see the concert? I did take some small comfort in the fact that it wasn’t one of his better shows. Because the Pope was in attendance, Bruce had really altered the set list, leaving out most of the favorites. After the show, there were many kids in the room, and I learned that Bruce had fathered them all with different women. My friend Patrick was there; he’d landed a new job as the Pope’s advance man. (The Pope also had some connection to this child-rearing operation.) Bruce then took all the kids out for pizza at some favorite local place. This one is a bit fuzzy, but I was at another Bruce concert, an outdoor one, in which my “seat” was my hospital bed somehow stuck to a steep cliff wall. There was also a WFMU table set up, where my friend Tim was working. And I had some concerns about wanting to stay till the end but not wanting to miss a ride back. Prior to my hospitalization, I had already incurred some medical bills, and was worried about how I’d pay them. So this was clearly weighing heavily on my mind, until I generated a simple solution. Springsteen and Little Steven had opened a rock-themed restaurant, one of a small chain I believe, on Manhattan’s far west side (convenient to Hoboken!). The Boss gave my mother and me what basically amounted to “no-show” jobs: We’d be paid all the time, but only had to work when the band wasn’t on tour. I didn’t understand the logic — wouldn’t they need extra staff when they were on the road, away from home? But it was explained to me that, no, Bruce wanted his crew to be able to really rest when they weren’t touring. OK, fine. My job was simply to be there at the opening each day. Once I’d done it for a while, I could switch to closings. This was excellent; my financial concerns were totally behind me. What a wonderful guy! And I was pretty sure I could help with booking bands — I immediately thought of Karyn Kuhl and James Mastro. So it was a win-win. I was so happy. • Hallucination #1: Harry Connick Jr.